It was impossible to solve all the problems of polyester dyeing by mere modification of HT winch beck. It was increasingly felt that dyeing time was too long in these machines. All the disadvantages of HT winch becks had been overcome by the jet dyeing machine, based on a Venturi tune in which the circular movement of the liquor carries the fabric round with it in a totally enclosed tubular chamber, annular in shape. 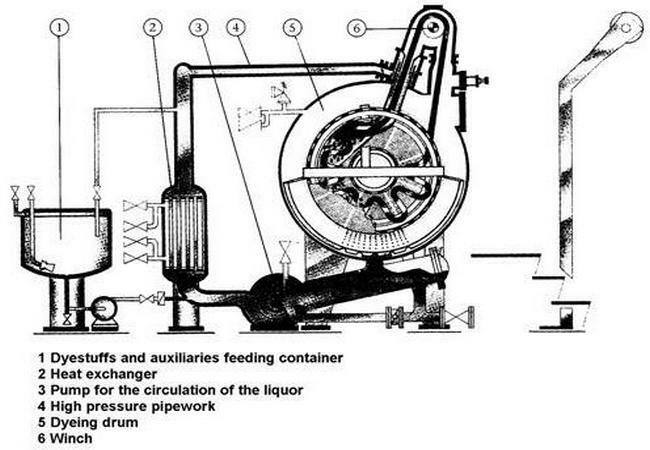 The Venturi tube is a constriction in the annular passage through which the flow rate of the liquor must be increased, thus causing suction, which imparts movement of the fabric. Jet dyeing is now quite a mature technology. A large number of machine manufacturers have introduced jet dyeing machines with various advanced facilities. One fundamentally new innovation is the use of air, either in addition to or instead of water, as the motive force in driving the fabric rope. Automatic controlled variable jets e.g. vario Jet and Thies. Semi-automated salt dissolving and doing system. Spray system for efficient cleaning. The active phase, in which the fabric moves at high speed, passing through the jet at vigorous pick up of fresh dye-liquor, about 2% of the total time, the material is in active phase. The passive phase, in which the fabric moves slowly around the system until it is feed back to the jet. Utility lines i.e. water line, drain line, steam inlet etc. Dyeing at 125°C causes much rapid dyeing with better penetration, exhaustion and levelness, less dye at the surface resulting in quicker washing with marginally better fastness properties. Less lengthways tension and slightly greater fullness of handle. Lower material to liquor ratio provides savings in energy and faster heating and cooling. Frequent movement of fabric minimizes creasing problem. Vigorous circulation of liquor and material causing quicker dyeing. High capital investment and maintenance costs. Limited accessibility to the material when the machine is running, the fabric is loaded and unloaded through a small port. Any roughness inside the machine causing snagging of the fabric is difficult to locate. Vigorous movement of the liquor may create severe foaming. The chemicals having a tendency to create foam should be avoided and de-foaming agents may be added in the machine before dyeing. Foaming problem can be avoided by using fully flooded jet dyeing machines. Internal cleaning is difficult as the machine is completely enclosed. Most machines are fitted with one or more port holes with illumination, but except when producing pale dyeing, the fabric movement is difficult to perceive. The force of the jet may be damaging for delicate fabrics. Sampling of dyed fabric during dyeing is difficult. A remote-control cigar-cutter may be fitted near the port, the fabric movement may be stopped when a joint is near the port, the cutter is advanced, a sample is removed and is withdrawn through a pressure lock. The width of the bottom compartment is designed to accommodate the widest fabric likely to be dyed in the machine; lightweight narrow fabrics may not fill up the available space uniformly and may get entangled.